Are the terms and conditions of each event the same? The broader terms of all ticket sales are governed by the Consumer Protection Act of SA and over and above that, each event has its own set rules that applies to the specific venue or event type and can thus differ from one event type / venue to the other. Where can I find the terms and conditions for of each event? The terms and conditions of entry at each event will be found when selecting the event window/image of your choice on the home page. Once you have selected an event scroll down the page, the terms and conditions will appear under the image of the event and the "Book Now" button. Please read carefully before booking tickets to understand the rules of each event. What steps do I follow during payment process? Can I select specific seats? Yes! Start by selecting the block you prefer to sit in. We will allocate the best available seats in that block for you. Then on the shopping cart click on "View/Change" next to one of the seats to see a seat layout picture of the block with your seats numbered and highlighted. Please use the colour seat legend on the far right to understand what the different highlighted seat colours mean. Once you have changed your seats you can select “Continue to Checkout” to finalize your booking. Can I book tickets from a retail outlet or can I only collect tickets from them? Are there any hospitality packages on sale, or suites to hire for events? There are different hospitality packages and private suites available for most International events, but you need to contact the respective venues for details. Can I search for a main featured event on the website? You can find our main featured event on our homepage which is the main banner with an event start time countdown clock. Just one click of the mouse on the banner and it will take you to our main event with all the detailed event info. Can I purchase Blue Bulls season tickets? On our home page mouse over and click on the "Season Tickets" link in the menu bar. Then click on the "Buy new Bulls season tickets" image link, you will be then asked to fill out your information. Just follow the process all the way through to the end of the season ticket booking process. Can I renew my Lions season tickets? On our home page mouse over and click on the "Season Tickets" link in the menu bar. Then click on the "Renew your Bulls season tickets" image, you will be then asked to fill out your information just follow the process all the way through to the end of the renewal season ticket booking process. Can I purchase Lions season tickets? On our home page mouse over and click on the "Season Tickets" link in the menu bar. Then click on the "Buy new Lions season tickets" image link, you will be then asked to fill out your information. Just follow the process all the way through to the end of the season ticket booking process. Then click on the "Renew your Lions season tickets" image, you will be then asked to fill out your information just follow the process all the way through to the end of the renewal season ticket booking process. Can I purchase Sharks season tickets? On our home page mouse over and click on the "Season Tickets" link in the menu bar. Then click on the "Buy new Sharks season tickets" image link, you will be then asked to fill out your information. Just follow the process all the way through to the end of the season ticket booking process. Can I renew my Sharks season tickets? Then click on the "Renew your Sharks season tickets" image, you will be then asked to fill out your information just follow the process all the way through to the end of the renewal season ticket booking process. You can track all your favourite up and coming events through-out the year in our Events Calendar just click on "Events Calendar" on the home page in the top menu bar. Match Day Questions: What if it is raining on a cricket match day? The decision to call off the match will only be made on the day at the start of the match. Payment: Cancellations - I made a mistake with my booking. Can I cancel the tickets? The policy of the promoters is that NO cancellations, refunds of unused tickets, changes, reprints or unpaid reservations can be made. Bookings are final and tickets are treated as CASH and cannot be replaced. Exceptions are handled directly by the promoters. Payment: Notifications - I have not received confirmation for tickets I bought? Ticketpro will always e-mail a confirmation a few minutes after a successful purchase online to the email address linked to the contact profile that you have logged in with (or that was stored in the cookies of your PC) at the time of purchasing the tickets. If you have more than one email address, check on the other mailboxes as well. Remember if you used the Facebook login option, it will use the email address you specified on your Facebook profile. Also check your junk mail folders, as sometimes the e-mail is diverted there due to your mail filters. Can I cancel my tickets and get a refund for unused tickets? If a cricket event is rained out or cancelled will I get a refund? If the event/match is cancelled, refunds are at the discretion of the promoter. The promoter handles, and is responsible for, all communications to ticket-buyers to announce whether refunds will take place, where and when. Ticketpro and PostNet are normally involved with the Refund Process. The original tickets are crucial as this is required to accompany the refund application and it is disqualified without it. I am having problems with home print and my tickets are not scanning at the gates on day of event? The tickets that you download from the link in the Ticketpro confirmation email, will render in the format of a normal A4 page PDF document. Please : Print the page(s) as is, on A4 paper. Can I call for assistance with home print? I tried to home print but it didn't work. What must I do? How can I add to my shopping cart without starting my whole booking process from the beginning? In your shopping cart just click the "Continue Shopping" button and continue booking as normal. How can I remove my seats/tickets from my shopping cart? How can I view and change my seats before paying? In your shopping cart under "My Seats" click on the "View/Change" link next to the seat/ticket you wish to change. Do I need to log out on a shared computer? How can I make a block booking? Do I have to pay for my infant/toddler to enter the stadium? At the rugby stadiums, infants and toddlers pay the same price as adults on the stands and will be required to show a ticket at the gate. No infants are allowed on laps. At some cricket stadiums children under 5 are issued ZERO value tickets at the stadium ticket office, however, there are always only a limited number of these seats available per match. There will usually be discounted Under 18 tickets in specific blocks available at all domestic matches while internationals usually charge adult prices for seats on the stands. I lost my tickets. My tickets were stolen. Can I get new tickets? My ticket has liquid damage. Will it work? Bar-code on the ticket is very sensitive, if there is any damage the bar-code might be unreadable. Rather be safe than sorry and get the ticket reprinted at your closet ticket office. My bar-code on my ticket is overlapping with the event detail text. Will my ticket scan at the gates? Make sure that when you collect your tickets from any outlet that the bar-code is not overlapping with any text and that the whole bar-code is printed. The scanners at the stadium are very sensitive and your ticket will not scan if the bar-code looks damaged. A reprint is required! I booked tickets online for an event tomorrow. I selected to collect at a retail outlet but the website says that I must collect before the event. What do I do now? I bought tickets online and went to a retail outlet to collect, but the tickets were not there. Why not? When you purchase your tickets on-line you are asked to select a collection point. If you do not make that selection the outlet will not have the tickets printed in advance, but they will still be able to print the tickets for you if you give them your reference number and wait while they print the tickets. I forgot to select a collection point for my tickets when I booked online. What do I do now? You will receive a confirmation e-mail soon after you make your online booking, assuming you entered a correct e-mail address on registration. In that mail you will be able to select a collection point by clicking on a link. I selected a collection store but now I want to change my mind. Can I go to any store? If the tickets have not been printed then any store can print the tickets, however if they have been printed already at your selected store then you have to collect them there. The stores normally print all their tickets first thing every morning. What benefits are there if I link my tickets to my NFC Card? You will also receive confirmation of your seat allocation by SMS or by e-mail. Can I view my seats on my mobile phone? Payment - How can I get a Tax invoice before I buy my tickets? If you need an invoice to generate the payment then you must contact the promoter first. They will send an invoice and you must then pay into their account and they will do the sale for you. If you purchase online and do not pay immediately then the sale will be abandoned. How can I get a tax invoice/receipt? I do not have a credit card or Internet Banking. How can I buy tickets? Tickets can be purchased at any of the retail outlets listed on the website OR at one of the venues. I do not live in South Africa. Can I buy tickets online? 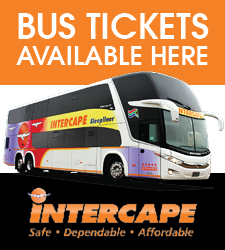 Yes you can buy tickets on www.ticketpros.co.za and pay with a Visa, Master card and American Express. You can collect from a retail store when you get to South Africa or select delivery by courier. I have a foreign (non-South African Bank) credit card. Can I use it to purchase tickets online? I purchased tickets on the website but after entering my card details my computer switched off. How do I know if the payment went through? If you entered a correct e-mail address on registration and the booking was successful then you will receive an e-mail confirmation shortly thereafter. If you haven't received this confirmation it is likely that the sale was unsuccessful. 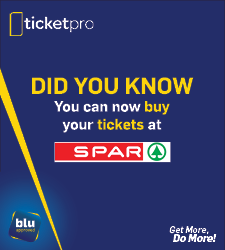 E-mail the help-line on info@ticketpros.co.za to confirm. There was a failure before I could complete my purchase but I have already paid by EFT! Paying by EFT via PayFast is a two-step process for most buyers. First the money is transferred from your bank account into your PayFast “electronic wallet”. The second step is finally paying the Ticketpro transaction with the credit that is in your PayFast electronic wallet. Sometimes this step is overlooked, which means the money never reaches TicketPro but remains in the client's PayFast wallet. (TicketPro sends out an email to advise the ticket-buyer that the payment has not reached us). Remember that a confirmation from the bank / PayFast that funds were paid / received does not mean that it was paid to TicketPro, their confirmation relates to the funds that moved from the bank account to the PayFast Wallet. In a case such as the above, the transaction will automatically abandon after some time and the tickets be put back into inventory for sale. You now have the option to go through the purchase process again and at the point where payment has to be made, there will already be credit in your PayFast wallet, with which payment can be effected. Payment: Exchanges - I want to change the seats I bought. Can I do that? The policy of the promoters is that NO cancellations, refunds on unused tickets, changes, reprints or unpaid reservations can be made. Bookings are final and tickets are treated as CASH and cannot be replaced. Exceptions are handled directly by the promoters. Website: Day to Day Questions - Why can't I see an event on the website? Sometimes events are taken offline for short periods for maintenance. Please try again in a few minutes.